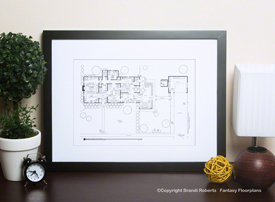 Buy a floor plan poster of Don and Betty Draper's Ossining home | First Floor! 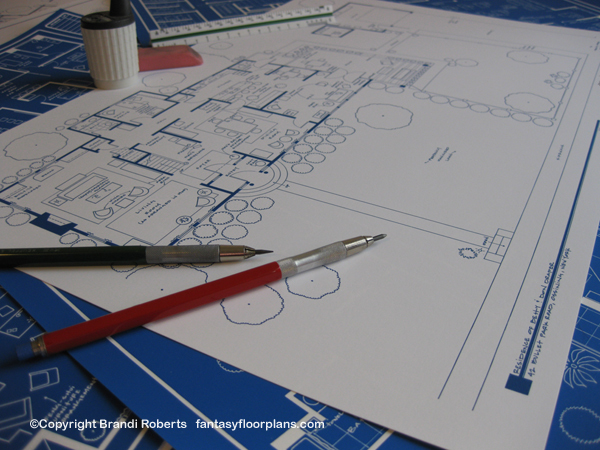 Welcome to my fictional, expertly hand-drafted floor plan for Betty and Don Draper's classic, colonial, two-story home from Mad Men. Entering through the foyer you are greeted with Don's briefcase in the floor and Ray-Ban aviator sunglasses on the table. Entering the formal living room, as arranged in 1960, you'll find custom built-in bookcases and a warm and inviting fireplace. The dining room has plenty of room for entertaining ad big-wigs like Roger Sterling. The den is a cozy place for the family to watch TV on their early black and white television. Don's ad ideas are sitting on the sofa. Wood paneling, typical for the era, adorns the walls. Bobby's tricycle sits in front of the french doors which lead to a large deck. The kitchen features second-hand smoke clouds 'cause Betty is always smokin' up a storm while preparing meals. On the counter is a frozen Sara Lee cake. The rear hallway leads to a small powder room and Don's office. In the office there is a locked drawer which is full of cash and secrets. Outside you'll find a playhouse for the kids that Don put together. Glenn hid in here. The garage has ample storage space and in the fridge you'll find Fielding beer. Just past the garage, near the edge of the yard, are Betty's BB shells. Apparently birds really irritate her. 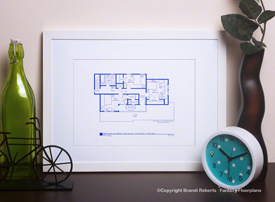 Pair this with Don and Betty's second floor for the complete set! 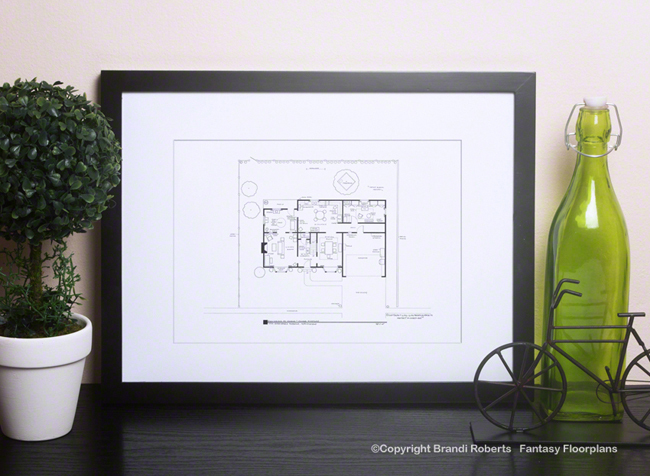 Don and Betty Draper's home floor plans are a great gift and conversation piece! 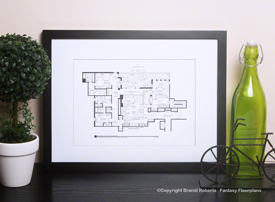 If you love Mad Men, make sure you check-out my entire collection of Mad Men floor plans including: the 23rd floor of Sterling Cooper Offices, the 22nd Floor of Sterling Cooper Offices, the 37th Floor of Sterling Cooper Draper Pryce, Don Draper's bachelor apartment, and Megan and Don's swanky New York apartment. I also offer my Sterling Cooper floor plans as a set. And Don Draper's homes can also be purchased as set.